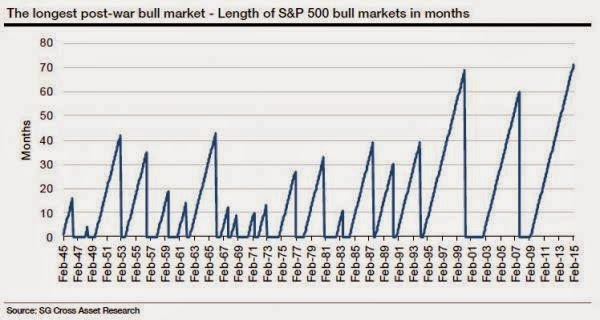 Remember the chart above the next time you hear "we are just beginning" the new bull market in stocks. Even more assuring to the bulls is that stocks no longer even fall by 10%, which may at least make investors sweat. This same type of steady run and assurance was last felt entering 2007. Finally you have the most recent 6 year movement in the S&P 500 (currently over 200%), which is the third strongest since 1900. What followed the two others, in 1929 and 2000, are widely considered the greatest crashes in history. The jobs report in the United States on Friday blew away expectations at +295,000. With the jobs market growing it should only provide the next catalyst for U.S. stocks moving higher, right? The unemployment rate is currently sitting at a 6 year low. 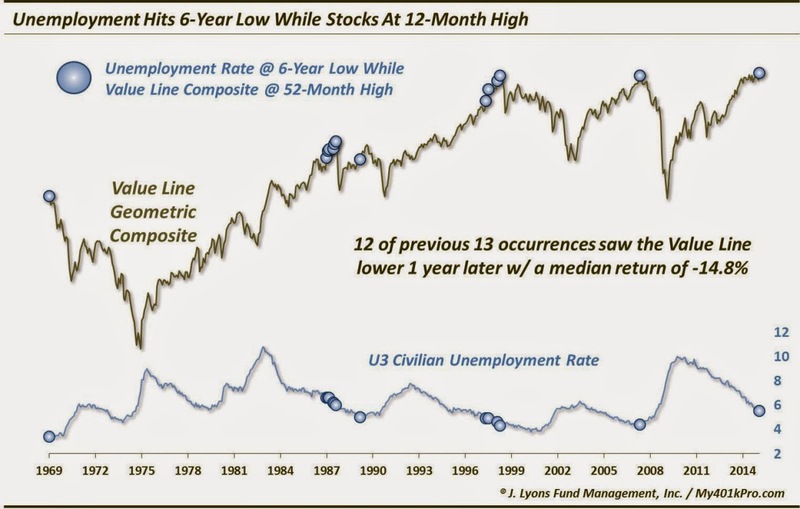 The chart below shows that in 12 of the previous 13 occurrences of a 6 year low, the median return for U.S. stocks over the next year was -14.8%. Bull markets do not end with bad news. Bull markets end when stocks fail to advance on good news. This occurred on Friday when the market sold off hard following the excellent jobs number. One day certainly does not make a trend and we could definitely go higher from here, but it provides an example of how things get started to the downside. Outside of the jobs number most of the macro economic data in the United States has been surprising to the downside. 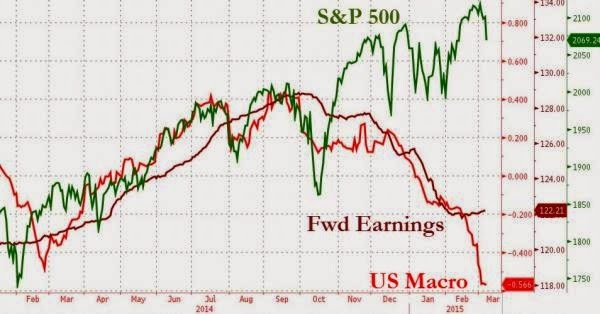 This is occurring at the same time earnings have turned down and there are even estimates of negative earnings reports over the coming quarters. The U.S. stock market has ignored all this data and continues to blast higher week by week. A market that loses complete regard for the surrounding fundamentals of the economy should be a concern for those overweight within their portfolio. 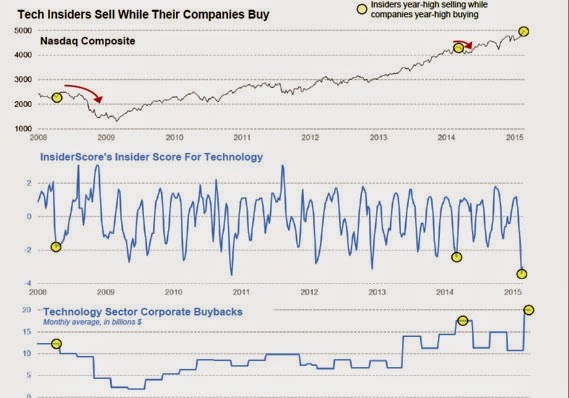 One of the biggest contributors to the supercharged gains in the U.S. market over the past few years has been stock buybacks (companies buying their own stock). In February we saw the largest month of buybacks in history at $118 billion. Companies tend to increase the amount of stock they buy as prices rise because there is confidence prices will move higher backing those purchases. Something changed to accelerate this strategy in 2004 which can be seen in the chart below. The S&P 500 forward earnings yield (blue line) crossed above the corporate bond yield (red line). This is a topic we have covered in detail in the past, but in today's world of ridiculously low interest rates it make sense for companies "on paper" to issue debt to purchase their own stock. This is why you do not see the mountain of stock buybacks at the peak in 2000, which is widely considered the greatest period of euphoria in history (more on that in a moment). As companies now have the ability to issue an unlimited amount of debt to a market starving for bonds at any price, they have a mountain of capital to purchase their own shares. On the NASDAQ you can see how well this is working out for the executives that make these decisions (chart below). They are dumping their own personal shares at the same time they repurchase a record amount of stock with company funds. Since the first quarter of 2009 through the third quarter of 2014 companies have bought back $2.1 trillion of their own stock. From the first quarter of 2009 to the end of 2014 they have paid out $1.6 trillion in dividend payments. Because investors often set their accounts to auto reinvest dividend payments back into the market, this has been another supercharge to share prices (most of the $1.6 trillion has found its way back into the market). The S&P 500 is currently trading at 18.1 forward earnings, putting it in the 99th percentile of historical valuation since 1976. Forward earnings are based on Wall Street's optimistic forward looking earnings growth. Looking at real earnings, the story becomes even darker. The following shows the average of four major equity market valuations. 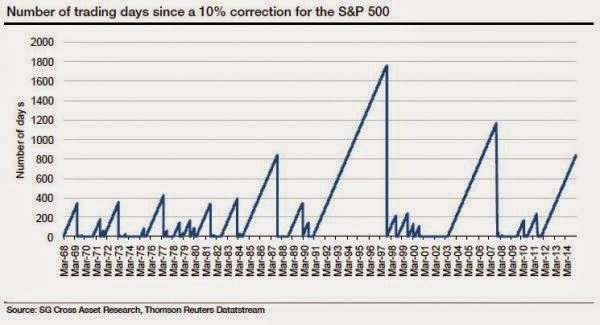 The market is currently close to the peak last seen in 1929, when it topped and fell by 89%. It still has a ways to go before reaching the peak of the mania in 2000, but as we have discussed before, there were a select few technology stocks during that period which dragged the valuation of the entire market upward. If you look at the median stock price in the S&P 500 today (or the broader market as a whole), the valuations are far worse than the 2000 peak. The next graph adds context to the one above, and I recommend you walk through it piece by piece to understand it. Using the data above it shows what happened to the market when the economy entered recession after reaching each record high valuation point. For example, during the recession from March 2001 to November 2001 which lasted 8 months, stocks began the recession with a 108% average valuation and the market fell 49.1% during the decline. The only other comparable time in terms of valuation danger was when the U.S. entered a recession in August 1929. The valuations then were resting at 74% and stocks fell 86.1%. 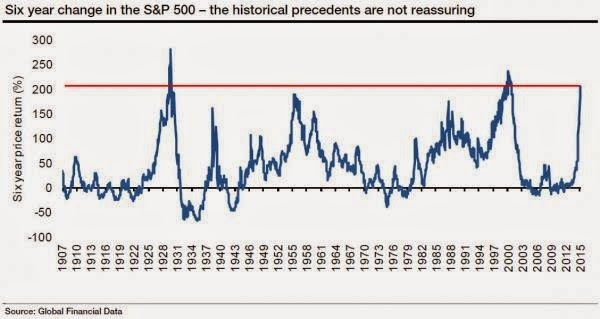 If we were to enter recession today, we would do so at valuation levels between 2001 and 1929 in terms of danger. My personal guess is the next crash will take us down somewhere between 50% to 80%, so this makes sense based on history. 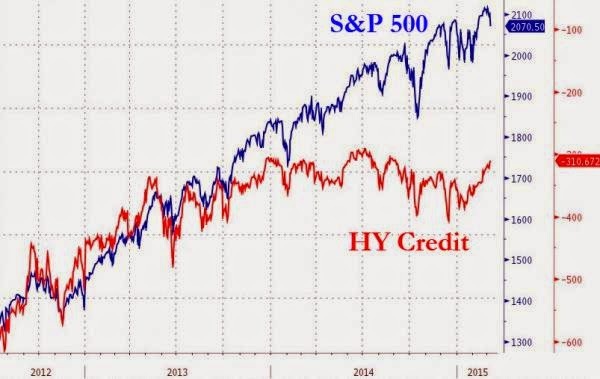 High yield bonds peaked last year and have tracked away from the froth in the U.S. stock market. Commodities have been also broken away to the downside as global demand slows down with the economy. When will U.S. stocks find gravity? It's impossible to know. What we do know is that the further we move higher while all the fundamentals continue to weaken the more gruesome the massacre will be when reality finally returns.